"Japanese earthquake" redirects here. For the 11 March 2011 earthquake in the Tōhoku region, see 2011 Tōhoku earthquake and tsunami. This is a list of earthquakes in Japan with either a magnitude greater than or equal to 7.0 or which caused significant damage or casualties. As indicated below, magnitude is measured on the Richter magnitude scale (ML) or the moment magnitude scale (Mw), or the surface wave magnitude scale (Ms) for very old earthquakes. The present list is not exhaustive, and reliable and precise magnitude data is scarce for earthquakes that occurred prior to the development of modern measuring instruments. The islands of Japan are primarily the result of several large oceanic movements occurring over hundreds of millions of years from the mid-Silurian to the Pleistocene as a result of the subduction of the Philippine Sea Plate beneath the continental Amurian Plate and Okinawa Plate to the south, and subduction of the Pacific Plate under the Okhotsk Plate to the north. Japan was originally attached to the eastern coast of the Eurasian continent. The subducting plates, being deeper than the Eurasian plate, pulled Japan eastward, opening the Sea of Japan around 15 million years ago. The Strait of Tartary and the Korea Strait opened much later. Today the Japanese archipelago is considered a mature island arc and is the result of several generations of subducting plates. Approximately 15,000 km of oceanic floor has passed under the Japanese area in the last 450 million years, with most being fully subducted. Japan is situated in a volcanic zone on the Pacific Ring of Fire. Frequent low intensity earth tremors and occasional volcanic activity are felt throughout the islands. Destructive earthquakes, often resulting in tsunamis, occur several times a century. Most of the earthquakes following that occurred in Japan happened because of a destructive plate boundary. This is when continental and oceanic plates collide and the heavier, more dense oceanic plate ‘sinks’ underneath the continental one. Although there is mention of an earthquake in Yamato in what is now Nara Prefecture on August 23, 416, the first to be reliably documented took place in Nara prefecture on May 28, 599 during the reign of Empress Suiko, destroying buildings throughout Yamato province. Many historical records of Japanese earthquakes exist, and the Imperial Earthquake Investigation Committee was created in 1892 to conduct a systematic collation of the available historical data, published in 1899 as the Catalogue of Historical Data on Japanese Earthquakes. Following the 1923 Great Kantō earthquake, the Imperial Earthquake Investigation Committee was superseded by the Earthquake Research Institute in 1925. In modern times, the catalogues compiled by Tatsuo Usami are considered to provide the most authoritative source of information on historic earthquakes, with the 2003 edition detailing 486 that took place between 416 and 1888. In Japan, the shindo scale is commonly used to measure earthquakes by seismic intensity instead of magnitude. This is similar to the Modified Mercalli intensity scale used in the United States or the Liedu scale used in China, meaning that the scale measures the intensity of an earthquake at a given location instead of measuring the energy an earthquake releases at its epicenter (its magnitude) as the Richter scale does. Unlike other seismic intensity scales, which normally have twelve levels of intensity, shindo (震度, seismic intensity, literally "degree of shaking") as used by the Japan Meteorological Agency is a unit with ten levels, ranging from shindo zero, a very light tremor, to shindo seven, a severe earthquake. Intermediate levels for earthquakes with shindo five and six are "weak" or "strong", according to the degree of destruction they cause. Earthquakes measured at shindo four and lower are considered to be weak to mild, while those measured at five and above can cause heavy damage to furniture, wall tiles, wooden houses, reinforced concrete buildings, roads, gas and water pipes. November 26, 684 (Julian calendar) 8.4 MK (Kawasumi scale) 101–1000 Hakuhou Nankai earthquake 白鳳南海地震 Hakuhou Nankai jishin 32°48′N 134°18′E﻿ / ﻿32.8°N 134.3°E﻿ / 32.8; 134.3 Various references estimate the quake's magnitude at 8.0 to 8.4, with damage being "severe". The dates of the quake have also been listed variously as October 14 (incorrect date) and November 24. July 9, 869(J) 8.9 MK 1,000+ 869 Sanriku earthquake 貞観地震 Jōgan jishin 38°30′N 143°48′E﻿ / ﻿38.5°N 143.8°E﻿ / 38.5; 143.8 The resulting tsunami caused extensive flooding of the Sendai plain, destroying the town of Tagajō. May 20, 1293(J) 7.1 Ms 23,024 1293 Kamakura earthquake 鎌倉大地震 Kamakura Daijishin 35°12′N 139°24′E﻿ / ﻿35.2°N 139.4°E﻿ / 35.2; 139.4 The earthquake struck close to the city of Kamakura, Kanagawa and its magnitude has been estimated in the 7.1–7.5 range. It possibly triggered a tsunami (though not all experts agree) and the death toll has been reported as 23,024. July 26, 1361(J) 8.4 Ms Shōhei earthquake 正平南海地震 Shōhei Nankai Jishin 33°00′N 135°00′E﻿ / ﻿33.0°N 135.0°E﻿ / 33.0; 135.0 Triggered a tsunami. September 11, 1498(J) 8.6 MK 31,000 1498 Nankai earthquake 明応地震 Meiō jishin 34°00′N 138°06′E﻿ / ﻿34.0°N 138.1°E﻿ / 34.0; 138.1 Occurred off the coast of Nankai, Japan, at about 08:00 local time on 20 September 1498. It had a magnitude estimated at 8.6 MS and triggered a large tsunami. The death toll associated with this event is uncertain, but 31,000 casualties were reported. February 3, 1605 7.9 MK 5,000+ 1605 Nankai earthquake 慶長大地震 Keichō Daijishin 33°30′N 138°30′E﻿ / ﻿33.5°N 138.5°E﻿ / 33.5; 138.5 The 1605 Keichō Nankaidō earthquake occurred at about 20:00 local time on 3 February. It had an estimated magnitude of 7.9 on the surface wave magnitude scale and triggered a devastating tsunami that resulted in thousands of deaths in the Nankai and Tōkai regions of Japan. It is uncertain whether there were two separate earthquakes separated by a short time interval or a single event. It is referred to as a tsunami earthquake, in that the size of the tsunami greatly exceeds that expected from the magnitude of the earthquake. September 27, 1611 6.9 MK 3,700+ (Official estimate) 1611 Aizu earthquake 会津地震 Aizu Jishin Aizu basin, (Present day of Fukushima Prefecture) According to official estimated report, more than 3,700 human fatalities. Aizuwakamatsu Castle, many temples, and 20,000 houses collapsed in the damaged areas. December 2, 1611 8.1 2,000+ 1611 Sanriku earthquake 慶長三陸地震 Keicho Sanriku Daijishin 39°00′N 144°24′E﻿ / ﻿39.0°N 144.4°E﻿ / 39.0; 144.4 Occurred on December 2, 1611 with an epicenter off the Sanriku coast in Iwate Prefecture. The magnitude of the earthquake was 8.1M. June 16, 1662 7.25 - 7.6 M 700-900 1662 Kanbun Ōmi and Wakasa earthquake 寛文近江・若狭地震 kanbun Ōmi wakasa jishin Lake Biwa south Strong tremor in Ōmi · Wakasa area. This earthquake is causing crustal deformation (East of Lake Suigetsu: Rose 4.5 meter). December 31, 1703 8.0 ML 5,233 1703 Genroku earthquake 元禄大地震 Genroku Daijishin Edo This earthquake shook Edo and killed an estimated 2,300 people. The earthquake is thought to have been an interplate earthquake whose focal region extended from Sagami Bay to the tip of the Bōsō Peninsula as well as the area along the Sagami Trough in the open sea southeast of the Boso Peninsula. This earthquake then resulted in a tsunami which hit the coastal areas of the Boso Peninsula and Sagami Bay. The tsunami was reported to have caused more than 10,000 fatalities. October 28, 1707 8.6 ML 5,000+ 1707 Hōei earthquake 宝永地震 Hōei jishin Off the Kii Peninsula Struck both the Nankaidō and Tōkai regions, causing moderate to severe damage throughout southwestern Honshu, Shikoku and southeastern Kyūshū. April 24, 1771 7.4 MK 13,486 1771 Great Yaeyama Tsunami 八重山地震 Yaeyama jishin 24°00′N 124°18′E﻿ / ﻿24.0°N 124.3°E﻿ / 24.0; 124.3 The 1771 Great Yaeyama Tsunami (also called 明和の大津波, the Great Tsunami of Meiwa) was caused by the Yaeyama Great Earthquake at about 8 A.M. on April 24. 13,486 people (including 9,313 in Yaeyama Islands (8,815 in Ishigaki Island), 2,548 in Miyako Islands and 1,625 in other areas) were confirmed to be dead or missing and more than 3,000 houses were destroyed. The height of the tsunami was over 40 meters at Ishigaki Island, up to a maximum of 85.4 meters in the village called Miyara. In Tarama, estimated tsunami runup height was approximately 18 meters. To this day, boulders reportedly launched by the tsunami (called "tsunami stones") remain in the northwestern highlands of Miyakojima. According to unverified local legend, a small unnamed island in the area was swallowed by the tsunami and disappeared. An earthquake caused by volcanic activity of Mount Unzen (in the Shimabara Peninsula Nagasaki, Japan). It killed 15,000 people altogether, due in large part to a tsunami that was triggered by the collapse of nearby Mount Mayuyama's southern flank into the bay. The incident is also referred to with the phrase 'Shimabara erupted, Higo affected' (岛原大変肥后迷惑), as many people in Higo, (Kumamoto, located 20 km away across the Ariake Sea) were also killed by the resulting tsunami, which then bounced back to hit Shimabara again. December 18, 1828 6.9 MK 1,559 (official confirmed) 1828 Echigo Sanjō earthquake 越後三条地震 Echigo Sanjō Jishin Sanjo, Niigata Prefecture (then Echigo Province) According to the official confirmed report, 21,134 houses and buildings were damaged, and 1,204 of them burned down. There were 1,559 human fatalities, and 2,666 injured people in the affected area. May 8, 1847 7.3 M 8,600+ 1847 Nagano earthquake 善光寺地震 Zenkōji Jishin Nagano Basin (then Shinano Province) In the central area of Nagano, many buildings collapsed, including Zenkōji temple. The earthquake triggered a complex variety of resulting disasters, which included fires, landslides, and flooding due to the formation and subsequent collapse of a "dam" made of debris from the collapsed buildings. According to the confirmed official report, the death toll throughout the region reached at least 8,600. 21,000 houses were damaged and 3,400 burned, and an additional 44,000 homes were damaged by the landslides in the area. July 9, 1854 7.25 MK 995 (official confirmed) 1854 Iga Ueno earthquake 伊賀上野地震 Iga Ueno Jishin Iga, Mie Prefecture (then Iga Province) According to the official confirmed report, 2,576 houses and buildings were damaged, with 995 human fatalities and 994 injures in the affected area. 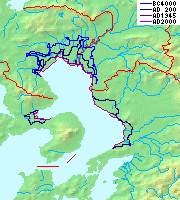 December 23, 1854 8.4 MK 2,000 (estimated) 1854 Tōkai earthquake 安政東海地震 Ansei Tōkai Jishin Suruga Bay The epicenter ranged from Suruga Bay to the deep ocean, and the quake struck primarily in the Tōkai region, but destroyed houses as far away as in Edo. The accompanying tsunami caused damage along the entire coast from the Bōsō Peninsula in modern-day Chiba prefecture to Tosa province (modern-day Kōchi Prefecture). December 24, 1854 8.4 MK 10,000+ 1854 Nankai earthquake 安政南海地震 Ansei Nankai Jishin Nankai Trough Over 10,000 people from the Tōkai region down to Kyushu were killed. November 11, 1855 6.9 MK 6,641 1855 Edo earthquake 安政江戸地震 Ansei Edo Jishin Edo, near the mouth of the Arakawa River One hundred and twenty earthquakes and tremors in total were felt in Edo in 1854–55. The great earthquake struck after 10 o'clock in the evening; roughly 30 aftershocks ensued, continuing until dawn. Records from the time indicate 6,641 deaths inside the city and 2,759 injuries; much of the city was destroyed by fire, leading many people to stay in rural inns. Aftershocks continued for twenty days. April 9, 1858 7.0 200–300 1858 Hietsu earthquake 飛越地震 Hietsu Jishin Atotsugawa Fault It occurred on the Atotsugawa Fault, which connects Mount Tate in Toyama Prefecture and the Amō Pass in Gifu Prefecture on the island of Honshū in Japan. Its name includes one kanji from Hida (飛騨国) and one from Etchū (越中国), the names of the provinces that were in use at the time. The earthquake is estimated to have killed 200–300 people. It also caused the Mount Tonbi Landslide and blocked the upper reaches of the Jōganji River. March 18, 1872 7.1 MK 551 (official confirmed) 1872 Hamada earthquake 浜田地震 Hamada Jishin off coast Hamada, Shimane Prefecture According to the official confirmed report, 4506 houses were damaged by the earthquake, 230 houses were burned, 551 people were killed, and landslides destroyed 6567 homes in the affected area. This quake occurred at 16:40 local time. February 22, 1880 5.5-6.0 0 1880 Yokohama earthquake 横浜地震 Yokohama Jishin Yokohama City The damage was minor. However, the Seismological Society of Japan was established in response to the quake. July 28, 1889 6.3 20 1889 Kumamoto earthquake 熊本地震 Kumamoto Jishin Tatsuda fault First major earthquake after the establishment of the Seismological Society of Japan in 1880. October 28, 1891 8.0 ML 7,273 1891 Mino–Owari earthquake 美濃・尾張地震 Mino Owari Jishin Neodani Fault A large earthquake that struck the former provinces of Mino and Owari in the Nōbi Plain area during the Meiji period in Japan. It is also referred to as the Nōbi Earthquake (濃尾地震 Nōbi Jishin) or the Great Nōbi Earthquake (濃尾大地震 Nōbi Daijishin). June 20, 1894 6.6 ML 31 1894 Tokyo earthquake 明治東京地震 Meiji-Tokyo Jishin Tokyo Bay This earthquake occurred in Tokyo, Japan at 14:04 on June 20, 1894. It affected downtown Tokyo and neighboring Kanagawa prefecture, especially the cities of Kawasaki and Yokohama. The depth of the 1894 earthquake has not been determined, but it is thought to have occurred within the subducting Pacific Plate under the Kantō region. The death toll was 31 killed and 157 injured. October 22, 1894 7.0 ML 726 (Official confirmed) 1894 Shōkai earthquake 庄内地震 Shōnai Jishin Sakata, Yamagata Prefecture According to the official confirmed report, 14,118 houses and buildings were damaged and 2,148 were burned. There were 726 human fatalities and 8,403 people injured in the damaged area. A large-scale fire broke out in Sakata, and around the Shonai plain area, many instances of cracked earth, sinking ground, sand boils, and fountains were observed. June 15, 1896 8.5 ML 22,000+ 1896 Sanriku earthquake 明治三陸地震 Meiji Sanriku Jishin This quake occurred off the coast of Sanriku in Iwate Prefecture, which caused a tsunami of 25 m (82 ft) to strike 35 minutes after the quake, destroying hundreds of houses and killed over 22,000 people. Tsunami were also observed as far away as Hawaii and in California. (Kantō Daishinsai) Izu Ōshima An earthquake which struck the Kantō plain on the Japanese main island of Honshū at 11:58 on the morning of September 1, 1923. Varied accounts hold that the duration of the earthquake was between 4 and 10 minutes. The quake had an epicenter deep beneath Izu Ōshima Island in Sagami Bay. It devastated Tokyo, the port city of Yokohama, and the surrounding prefectures of Chiba, Kanagawa, and Shizuoka, and caused widespread damage throughout the Kantō region. The power and intensity of the earthquake is easy to underestimate, but the 1923 earthquake managed to move the 93-ton Great Buddha statue at Kamakura. The statue slid forward almost two feet. Casualty estimates range up to about 142,800 deaths, a figure including approximately 40,000 who went missing and were presumed dead. May 23, 1925 6.8 ML 428 1925 Kita Tajima earthquake 北但馬地震 Kita Tajima Jishin Toyooka in Hyōgo Prefecture This earthquake's epicenter was (35.6 degrees north latitude, 134.8 degrees east longitude), in the Maruyama River estuary. According to the Japanese government's official report, there were 428 human fatalities, 1,016 people injured, 7,863 buildings destroyed, and 45,659 houses damaged by collapse or fire. This quake caused extensive damage to the town of Toyooka and the Maruyama River area. Just before the shaking could be felt, a sound like a cannon was reportedly heard intermittently from the direction of the estuary near the Maruyama River. During the earthquake, the ground in the town of Tokyooka experienced strong seismic vibrations for 16 seconds. As most of the buildings of the time were wooden, many of them were destroyed at once during the initial earthquake. In the fire that broke out subsequently, half of Toyooka was burned down, with many deaths resulting (a reported 8% of the town's population.) 272 deaths were confirmed to have occurred in the Kinosaki area. March 7, 1927 7.6 ML 3,020 1927 Kita Tango earthquake 北丹後地震 Kita Tango Jishin Tango Peninsula in Kyoto Prefecture Almost all of the houses in Mineyama (now part of Kyōtango) were destroyed, and the quake was felt as far away as Tokyo and Kagoshima. A major earthquake whose associated tsunami caused widespread damage to towns on the Sanriku coast of the Tōhoku region of Honshū, Japan in 1933. September 10, 1943 7.2 ML 1,083 1943 Tottori earthquake 鳥取地震 Tottori Jishin offshore from Ketaka District An earthquake which occurred in Tottori prefecture, Japan at 17:36 on September 10, 1943. Although the earthquake occurred during World War II, information about the disaster was surprisingly uncensored, and relief volunteers and supplies came from many parts of the Japanese empire, including Manchukuo. The Tottori earthquake had its epicenter offshore from Ketaka District, now part of Tottori city, with a magnitude of 7.2 on the Richter Scale. The magnitude of the earthquake was 6.0 in Tottori city, and 5.0 as far away as Okayama on the Inland Sea. December 7, 1944 8.1 Mw 1,223 1944 Tōnankai earthquake 昭和東南海地震 Shōwa Tōnankai Jishin 34°00′N 137°06′E﻿ / ﻿34.0°N 137.1°E﻿ / 34.0; 137.1 This earthquake occurred on Dec. 7, 1944, at 13:35 local time (04:35 UTC). Its moment magnitude was 8.1 and it was felt with a maximum intensity of 5 on the Shindo scale (or VII, "Severe", on the Mercalli intensity scale). It struck the provinces along the coast of the Tōkai region, causing serious damage and triggering a tsunami. The earthquake and tsunami combined killed 1,223 people, with injuries reported to have affected 20,000 people or more. January 13, 1945 6.8 ML 1180 + 1126 missing 1945 Mikawa earthquake 三河地震 Mikawa Jishin Mikawa Bay An earthquake which occurred off Mie and Aichi prefectures, Japan at 03:38 on January 13, 1945. As the earthquake occurred during World War II, information about the disaster was censored, and efforts at keeping the disaster secret hampered relief efforts and contributed to a high death toll. The Mikawa earthquake had its epicenter offshore in Mikawa Bay (34°42.1′N 137°6.8′E﻿ / ﻿34.7017°N 137.1133°E﻿ / 34.7017; 137.1133 at a depth of eleven kilometers). The city of Tsu recorded a magnitude of 6 on the Richter Scale; however, areas in southern Aichi prefecture were closer to the epicenter, and suffered significant damage. December 20, 1946 8.1 Mw 1,362 1946 Nankai earthquake 昭和南海地震 Shōwa Nankai Jishin Nankai Trough A major earthquake in Nankaidō, Japan. Occurred on December 20, 1946 at 19:19 UTC. The earthquake was felt from Northern Honshū to Kyūshū. June 28, 1948 7.1 Mw 3,769 1948 Fukui earthquake 福井地震 Fukui Jishin near Maruoka, Fukui A major earthquake in Fukui Prefecture, Japan. It struck at 5:13 p.m. on June 28, 1948 (the then Japan Daylight Saving Time; JDT). The strongest shaking occurred in the city of Fukui, where it was recorded as 6 (equivalent to the current 7) on the Japan Meteorological Agency seismic intensity scale. The coordinates of the earthquake were 36゜10.3'N　136゜17.4'E (around the town of Maruoka). March 4, 1952 8.1 Mw 28 1952 Hokkaido earthquake 1952年十勝沖地震 Sen-kyūhyaku-goūjūni-nen Tokachi-Oki Jishin 42°18′N 144°54′E﻿ / ﻿42.3°N 144.9°E﻿ / 42.3; 144.9 The 1952 Hokkaido earthquake took place around March 4, 1952 in the sea east of Hokkaido. On the Moment magnitude scale, it measured 8.1. Casualties occurred due to the earthquake. August 19, 1961 7.0 8 1961 Mino earthquake 北美濃地震 Kitamino Jishin 36°6′7″N 136°42′0″E﻿ / ﻿36.10194°N 136.70000°E﻿ / 36.10194; 136.70000 One of the earthquakes that the Japan Meteorological Agency named for the. 8 people dead. June 16, 1964 7.6 Mw 26 1964 Niigata earthquake 新潟地震 Niigata Jishin 50 km north of Niigata The earthquake caused widespread soil liquefaction in the city of Niigata, resulting in unusually high levels of damage to buildings for the felt intensity. May 16, 1968 8.2 Mw 52 1968 Tokachi earthquake 1968年十勝沖地震 Sen-kyūhyaku-rokujūhachi-nen Tokachi-oki Jishin Offshore of Misawa, Japan This earthquake struck off the coast of Honshu Island, near Misawa Japan, Aomori Prefecture, and was followed by a significant tsunami. The earthquake and ensuing tsunami claimed 52 lives and resulted in significant material damage in Northern Japan. June 12, 1978 7.7 Ms 28 1978 Miyagi earthquake 宮城県沖地震 Miyagi-ken-oki jishin just offshore Miyagi Prefecture Damage was greatest around Sendai, and the earthquake triggered widespread landslides. May 26, 1983 7.8 Ms 104 1983 Sea of Japan earthquake 日本海中部地震 Nihonkai-chubu jishin off coast 50 miles (80 kilometers)from Noshiro, Akita Prefecture Rising up to 30 feet (10 meters) above the coastline, the tsunami created by this earthquake was observed throughout a wide area along the Sea of Japan's coast and caused damage from Tsuruoka to Goshogawara. 100 people lost their lives to the tsunami, including seawall construction workers and beachgoers. In total, 104 people were killed. Soil liquification was widely observed through the affected area. September 14, 1984 6.3 Ms 29 1984 Otaki earthquake 長野県西部地震 Nagano-ken-seibu jishin Mount Ontake, Otaki, Nagano Prefecture Overall, 29 people were killed and 10 injured. An earthquake in Japan that occurred on Tuesday January 17, 1995 at 05:46 JST in the southern part of Hyōgo Prefecture. It measured Mw 6.8 on the Moment magnitude scale (USGS), and Mj7.3 on the revised (7.2 on the old) JMA magnitude scale. The tremors lasted for approximately 20 seconds. The hypocenter of the earthquake was located 16 km (9.9 mi) beneath its epicenter, on the northern end of Awaji Island, 20 km (12 mi) away from the city of Kobe. May 4, 1998 7.5 Mw 0 1998 Ryukyu Islands earthquake 石垣島南方沖地震 Ishigakijima nanpō-oki jishin 22°18′N 125°18′E﻿ / ﻿22.30°N 125.30°E﻿ / 22.30; 125.30 The epicentre was in the Philippine Sea, far off the coast (260 km from Ishigaki Island, Japan, 400 km from Basco, Philippines, and 425 km from Hualian, Taiwan). September 25, 2003 8.3 Mw 1 2003 Hokkaidō earthquake 2003年十勝沖地震 Nisen-san-nen Tokachi-oki Jishin 41°47′N 143°52′E﻿ / ﻿41.78°N 143.86°E﻿ / 41.78; 143.86 An earthquake occurring in Hokkaido on September 25, 2003. It measured 8.3 on the Moment magnitude scale and caused extensive damage to roads all around Hokkaido, several power outages, and landslides which resulted in further damage. October 23, 2004 6.9 Mw 40 2004 Chūetsu earthquake 新潟県中越地震 Chūetsu Jishin Ojiya, Niigata Occurred at 5:56 p.m. (local time) on Saturday, October 23, 2004. The initial earthquake caused noticeable shaking across almost half of Honshū, including parts of the Tohoku, Hokuriku, Chūbu, and Kantō regions. March 20, 2005 7.0 Mw 1 2005 Fukuoka earthquake 福岡県西方沖地震 Fukuoka-ken Seihō Oki Jishin Fukuoka PrefectureIn the Genkai Sea about 6 km (3.7 mi) northwest of Genkai Island at the mouth of Fukuoka Harbor This earthquake struck Fukuoka Prefecture, Japan at 10:53:40 JST on March 20 and lasted for approximately 50 seconds. The quake occurred along a previously unknown fault in the Genkai Sea, North of Fukuoka city, and the residents of Genkai Island were forced to evacuate as houses collapsed and landslides occurred in places. Investigations subsequent to the earthquake determined that the new fault was most likely an extension of the known Kego Fault that runs through the center of the city. August 16, 2005 7.2 Mw 0 2005 Miyagi earthquake 宮城県沖地震 Miyagi-ken Oki Jishin Miyagi Prefectureabout 55 km (34 mi) due east of the Oshika Peninsula in Miyagi Prefecture A powerful earthquake that struck the east coast of the Japanese island of Honshū at 11:46 (02:46 UTC) on August 16, causing casualties, building collapses and power outages. The earthquake began on Tuesday, August 16, 2005, and affected Japan's northeastern coast. It triggered a tsunami warning, and buildings shook 200 miles away in the capital, Tokyo. It was initially estimated to have a rating of 6.8., and the U.S. Geological Survey later registered it as a 7.2. November 15, 2006 8.3 Mw 0 2006 Kuril Islands earthquake 2006年千島列島沖地震 Nisen-roku-nen Chishima Rettō Oki Jishin Kuril Islands about 160 km (99 mi) due east of the southern tip of Simushir in the Kuril Islands The earthquake happened at 20:29 JST on November 15, 2006, causing a tsunami to hit the Japanese northern coast. January 13, 2007 8.1 Mw 0 2007 Kuril Islands earthquake 2007年千島列島沖地震 Nisen-nana-nen Chishima Rettō Oki Jishin 46°28.8′N 154°04.48′E﻿ / ﻿46.4800°N 154.07467°E﻿ / 46.4800; 154.07467 The earthquake happened at 1:23 p.m. JST (04:23 UTC) and resulted in a tsunami warning but did not cause significant damage. The epicentre was located 95 km to the south east of the 2006 Kuril Islands earthquake that struck a few weeks earlier. March 25, 2007 6.9 Mw 1 2007 Noto earthquake 能登半島地震 Noto Hantō Jishin Ishikawa Prefectureabout 11 km (6.8 mi) due west of the southern end of the town of Wajima At 9:42 a.m., a magnitude 6.9 earthquake, struck the Hokuriku region of Japan, near the Noto Peninsula. The earthquake shook the city of Nanao and the town of Anamizu with a seismic intensity of 6+ on Japan's shindo scale. One death, in the city of Wajima, and at least 214 injuries have been reported. A tsunami advisory was immediately made for the Kaga coast and Noto coast, and a 10–20 cm wave hit shore about 30 minutes later. July 16, 2007 6.6 Mw 11 2007 Chūetsu offshore earthquake 新潟県中越沖地震 Niigata-ken Chūetsu Oki Jishin Niigata Prefectureabout 29 km (18 mi) west of Niigata The earthquake) was a powerful magnitude 6.6 earthquake that occurred 10:13 a.m. local time (01:13 UTC) on July 16, 2007, in the northwest Niigata region of Japan. The earthquake shook Niigata and neighbouring prefectures. The city of Kashiwazaki and the villages of Iizuna and Kariwa registered the highest seismic intensity of a strength 6 on Japan's shindo scale, but the quake was felt as far away as Tokyo. Eleven deaths and at least 1,000 injuries have been reported, and 342 buildings were completely destroyed, mostly older wooden structures. June 14, 2008 6.9 Mw 12 2008 Iwate–Miyagi Nairiku earthquake 岩手・宮城内陸地震 Iwate Miyagi Nairiku Jishin Iwate Prefectureabout 1 km (0.62 mi) east of Narusawa Onsen in northwest Iwate Prefecture This earthquake struck the central Tōhoku region, in northeastern Honshū, Japan. (Higashi Nihon Dai-Shinsai) 38°30′36″N 142°47′31″E﻿ / ﻿38.510°N 142.792°E﻿ / 38.510; 142.792, depth 29 km This megathrust earthquake's hypocenter was reported to be off the Oshika Peninsula, the east coast of Tōhoku It was the strongest to hit Japan and one of the top five largest earthquakes in the world since seismological record-keeping began. It was followed by a tsunami with waves of up to 10 m (33 ft). The disaster left thousands dead and inflicted extensive material damage to buildings and infrastructure that led to significant accidents at four major nuclear power stations. (Higashi Nihon Dai-Shinsai) 38°06′22″N 144°33′11″E﻿ / ﻿38.106°N 144.553°E﻿ / 38.106; 144.553, depth 19.7 km "Magnitude 7.1 - Off the East Coast of Honshu, JAPAN REGION". Earthquake.usgs.gov. Archived from the original on 2011-03-17. Retrieved 2011-03-12. 23:30:00 JST 7.1 Mw 4 2011 Miyagi earthquake aftershock 宮城県沖地震 Miyagi-ken Oki Jishin 38°15′11″N 141°38′24″E﻿ / ﻿38.253°N 141.640°E﻿ / 38.253; 141.640, depth 49 km "Magnitude 7.1 - Near the East Coast of Honshu, JAPAN REGION". Earthquake.usgs.gov. 7 April 2011. Archived from the original on 14 April 2011. Retrieved 2011-04-10. 17:16:13 JST 7.1 Mw 6 2011 Fukushima earthquake aftershock 福島県浜通り地震 Fukushima-ken Hamadori Jishin 37°00′25″N 140°28′37″E﻿ / ﻿37.007°N 140.477°E﻿ / 37.007; 140.477, depth 10 km "Magnitude 6.6 - East Honshu, JAPAN REGION". Earthquake.usgs.gov. 11 April 2011. Archived from the original on 28 July 2011. Retrieved 2011-04-30. ^ a b c Barnes, Gina L. (2003). "Origins of the Japanese Islands: The New "Big Picture"" (PDF). University of Durham. Retrieved August 11, 2009. ^ Hammer, Joshua. (2006). Yokohama Burning: The Deadly 1923 Earthquake and Fire that Helped Forge the Path to World War II, p. 62–63. ^ a b c "Earthquakes". Japan Guide. Retrieved August 11, 2009. ^ "Significant Earthquake: JAPAN". National Geophysical Data Center, part of the National Environmental Satellite, Data, and Information Service run by the National Oceanic and Atmospheric Administration. Archived from the original on January 26, 2016. Retrieved February 28, 2010. 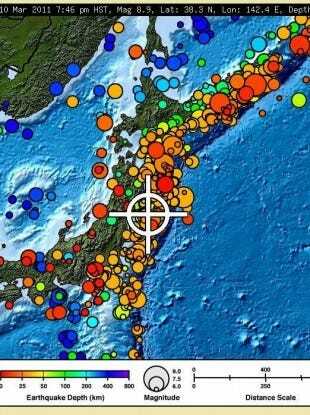 ^ "Significant Earthquake: JAPAN: MINO". National Geophysical Data Center, part of the National Environmental Satellite, Data, and Information Service run by the National Oceanic and Atmospheric Administration. Archived from the original on January 26, 2016. Retrieved February 28, 2010. ^ Satake, K; Sawai, Y.; Shishikura, M.; Okamura, Y.; Namegaya, Y.; Yamaki, S (2007). "Tsunami source of the unusual AD 869 earthquake off Miyagi, Japan, inferred from tsunami deposits and numerical simulation of inundation". American Geophysical Union, Fall Meeting 2007, Abstract #T31G-03. 2007: T31G–03. Bibcode:2007AGUFM.T31G..03S. ^ "Before 1600", Higai, JP, archived from the original on 2007-08-22 . ^ a b NGDC. "Comments for the Significant Earthquake". Retrieved 31 October 2010. ^ IISEE. "Search parameters page". Catalog of Damaging Earthquakes in the World (from ancient times through June, 2009). Retrieved 31 October 2010. ^ NGDC. "Comments for the Tsunami Event". Retrieved 31 October 2010. ^ Haeing Yoong, K. (2010). "Past three Kanto earthquakes inferred from the tsunami deposits survey in the southern Miura Peninsula, Central Japan". Geological Society of America Abstracts with Programs 42. p. 106. Retrieved 31 October 2010. ^ a b Paula Dunbar. "Significant Earthquake". Retrieved 15 April 2016. ^ Yuji Kanaori; Kazuhiro Tanaka; Masahiro Chigira (2000). Engineering geological advances in Japan for the new millennium. Elsevier. ISBN 9780080530925. ^ Toshihiko Sugai; Yuichiro Fusejima; Yasuo Awata; Takashi Azuma; Yoshihiko Kariya; Yasuhiro Suzuki. "Late Holocene paleoseismicity of the Yoro fault system". National Institute of Advanced Industrial Science and Technology. ^ Ishibashi, K. (2004). "Status of historical seismology in Japan" (PDF). Annals of Geophysics. 47 (2/3): 339–368. Retrieved 2009-11-22. ^ "History News Network - Danger in the Lowground: The Japan Earthquake in Historical Context". Retrieved 15 April 2016. ^ Miyazawa, M.; Mori J. (2005). "Historical maximum seismic intensity maps in Japan from 1586 to 2004: construction of database and application" (PDF). Ann. Disaster Prev. Res. Inst. Kyoto Univ. Archived from the original (PDF) on 22 July 2011. Retrieved 30 January 2010. ^ Usami, T. (1979). "Study of Historical Earthquakes in Japan" (PDF). Bulletin of the Earthquake Research Institute. 54: 399–439. Archived from the original (PDF) on 2011-07-22. Retrieved 2009-11-13. ^ a b c Kawade Shobō Shinsha Editorial Team (eds.). "Ansei Daijishin" (安政大地震, "Great Earthquakes of Ansei"). Ō-Edo Rekishi Hyakka (大江戸歴史百科, "Historical Encyclopedia of Great Edo"). Tokyo: Kawade Shobō Shinsha Publishers, 2007, p. 253. ^ Usami, Tatsuo. "The Hietsu Earthquake of April 9, 1858 and the Omachi Earthquake of April 23, 1858" (PDF) (in Japanese). Earthquake Research Institute, University of Tokyo. Archived from the original (PDF) on March 4, 2009. ^ "Source Parameters of the Tokyo Earthquake in Meiji Era (1894)". Japan Science and Technology Agency. Archived from the original on 2009-07-30. ^ "Inland earthquakes". The Headquarters for Earthquake Research Promotion. ^ "Research describes origin of devastating tsunami". American Geophysical Union. 1996-06-12. Retrieved 2009-05-19. ^ "Historic Earthquakes: Sanriku, Japan, 1896 June 15 UTC , Magnitude 8.5". US Geological Survey. 2009-01-29. Retrieved 2009-05-19. ^ "Historic Earthquakes: Tango, Japan, 1927 March 07 09:27 UTC, Magnitude 7.6". USGS. Retrieved 2009-05-19. ^ "Kanamori, H., 1977, The energy release of great earthquakes, J. Geophys. Res. 82, 2981-2987" (PDF). Archived from the original (PDF) on 2010-07-23. ^ "Historical Earthquakes:The 1933 Sanriku earthquake". United States Geological Survey. 14 March 2008. Archived from the original on 2008-07-24. Retrieved 2008-07-16. ^ "The Tottori Earthquake (September 10, 1943, M 7.2)". The Headquarters for Earthquake Research Promotion. ^ Paula Dunbar. "Significant Earthquake". Retrieved 15 April 2016. ^ Inada, Osamu; Mochizuki, Toshio; Miura, Fusanori; Taniguchi, Hitoshi. "Interpretation of damage to houses and casualties relied on a precise evaluation of earthquake ground motions in the epicentral region: 1945 Mikawa earthquake". En: 378–393. ^ "The 1946 Nankaido earthquake". USGS. 13 March 2008. Archived from the original on 2008-06-01. Retrieved 2008-06-29. ^ Kawasumi, H. (1968). "1. Introduction" (PDF). In Kawasumi H. (ed.). General Report on the Niigata Earthquake of 1964. Tokyo, Japan: Tokyo Electrical Engineering College Press. ^ "Maps of Pacific Ocean Tsunami Travel Times". NOAA. Retrieved 20 March 2011. ^ "History of Misawa Air Base". MisawaJapan.com. Retrieved 20 March 2011. ^ USGS. "Significant Earthquakes of the World 1978". Archived from the original on 23 January 2010. Retrieved 6 July 2010. ^ Sidle, R.C. ; Pearce, A.J. ; O'Loughlin, C.L. (1985). "1 Significance of Soil Mass Movement". Hillslope stability and land use. 11. American Geophysical Union. pp. 1–9. ISBN 978-0-87590-315-6. ^ U.S. Geological Survey. "Significant Earthquakes of the World: 1995". Archived from the original on 2008-06-01. Retrieved 2008-05-22. ^ a b The City of Kobe (2008-01-01). "STATISTICS" (PDF). The Great Hanshin-Awaji Earthquake: Statistics and Restoration Progress. Retrieved 2008-05-25. ^ "USGS Earthquake Hazards Program: Earthquake Report: Southeast of Taiwan". Neic.usgs.gov. Archived from the original on 2010-02-02. Retrieved 2010-07-09. ^ "Quake Shakes Buildings in Tokyo". The Associated Press. August 16, 2005. Archived from the original on February 7, 2016. Retrieved 2006-06-20. ^ staff. "Giant Earthquake Jolts Japan, But Tsunami Warnings Cancelled". www.ens-newswire.com. ^ "Hokuriku quake kills one, injures 170". The Japan Times. 2007-03-26. ^ "2007 年７月16 日10 時13 分ころ新潟県上中越沖で発生した地震について" (PDF) (in Japanese). Japan Meteorological Agency. 2007-07-16. Retrieved 2007-07-19. ^ a b c "Powerful earthquake strikes Niigata, causes leak at nuclear power plant". Japan News Review. 2007-07-16. Archived from the original on 2011-03-17. ^ "asahi.com：新潟、長野で震度６強 ８人死亡、９０８人がけが - 社会". ^ "Japanese nuke plant leaked after earthquake". AP via CNN. 2007-07-16. Archived from the original on August 10, 2007. Retrieved 2007-07-16. ^ "M6.5 quake jolts Shizuoka Pref, injuring more than 20". Kyodo. 2009-08-09. Archived from the original on 2009-10-15. Retrieved 2009-08-11. ^ "Magnitude 7.0 - RYUKYU ISLANDS, JAPAN". USGS. 2010-02-26. Retrieved 2010-02-27. ^ "Magnitude 7.4 - BONIN ISLANDS, JAPAN REGION". Earthquake.usgs.gov. Archived from the original on 2010-12-23. Retrieved 2010-12-21. ^ "Magnitude 7.2 - East Coast of Honshu, JAPAN REGION". Earthquake.usgs.gov. Retrieved 2011-03-09. ^ "Tsunami hits north-eastern Japan after massive quake". BBC News. 11 March 2011. Retrieved 11 March 2011. ^ a b "Magnitude 8.9 – Near the East coast of Honshu, Japan 2011 March 11 05:46:23 UTC". United States Geological Survey (USGS). Archived from the original on 12 March 2011. Retrieved 11 March 2011. ^ "8.9 Earthquake in Japan, Tsunami Warning to Russia, Taiwan and South East Asia". 11 March 2011. Retrieved 11 March 2011. ^ "Japan quake – 7th largest in recorded history". 11 March 2011. Archived from the original on 2011-03-16. Retrieved 11 March 2011. ^ "Magnitude 7.0 - Off the East Coast of Honshu, JAPAN". Earthquake.usgs.gov. 10 July 2011. Archived from the original on 2012-01-02. Retrieved 2011-07-11. ^ "Magnitude 7.3 - 293km SE of Kamaishi, Japan". United States Geological Survey (USGS). 7 December 2012. Retrieved 7 December 2012. ^ "M 7.1 - Off the east coast of Honshu, Japan". United States Geological Survey. 2013-10-25. Retrieved 2017-09-26. ^ "M7.8 - 189 WNW of Chichi-shima, Japan". United States Geological Survey. May 30, 2015. Retrieved May 30, 2015. ^ "M6.2 - 7km SW of Ueki, Japan". United States Geological Survey. April 14, 2016. Retrieved April 14, 2016. ^ "M 7.0 - 1km E of Kumamoto-shi, Japan". United States Geological Survey. April 15, 2016. Retrieved April 15, 2016. ^ "M6.9 - 37km ESE of Namie, Japan". United States Geological Survey. November 22, 2016. Retrieved November 22, 2016. ^ "M 5.3 - 1km SSW of Takatsuki, Japan". earthquake.usgs.gov. Retrieved 2018-06-18. ^ "M 6.6 - 27km E of Tomakomai, Japan". earthquake.usgs.gov. Retrieved 2018-09-06. Japan: large-scale floods and earthquakes. Organisation for Economic Co-operation and Development. International government publication. 2009. ISBN 978-92-64-05639-8. Alex K. Tang; Anshel J. Schiff (2010). Kashiwazaki, Japan, Earthquake of July 16, 2007. Organisation for Economic Co-operation and Development. American Society of Civil Engineers. ISBN 978-0-7844-1062-2.